Ballyglass RNLI has rescued three fishermen off the Mayo coast this morning, following a ten hour call out. The volunteer lifeboat crew was requested to launch their all-weather lifeboat at 7.45pm yesterday evening (Sunday, April 24 ) after a member of the public who was standing on the shore saw a vessel drifting and raised the alarm. The fishermen were on a 75ft vessel when they got into difficulty north east of Downpatrick Head. 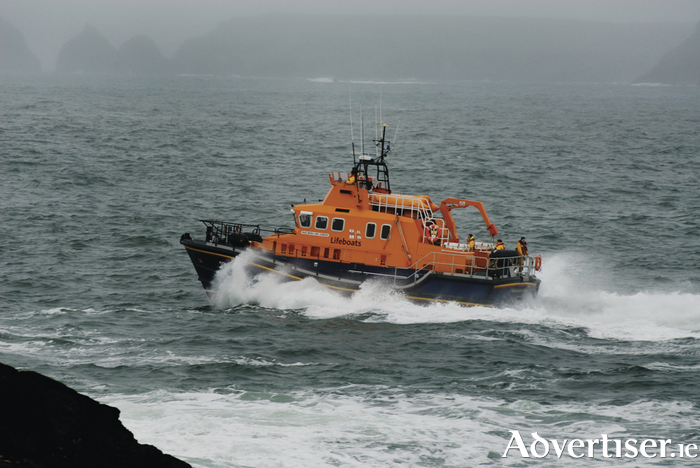 The lifeboat under Coxswain John Walsh and with four crew members onboard launched within minutes and made its way to the scene some six miles north of Killala. Weather conditions at the time were described as good with a north westerly Force 3 wind blowing. Once on scene, the lifeboat crew observed that no one was in any immediate danger and began to work with the three fishermen to set up a towline. With a tow in place, the lifeboat began the slow passage towards Killybegs in County Donegal. The weather conditions freshened as the night entered morning. As the lifeboat approached Killybegs at 3am, it was met by a tug at Rotten Island and the tow was passed over. The tug proceeded to bring the fishing vessel the remaining distance into the harbour at Killybegs. With all safe and well, the lifeboat crew began their return journey arriving back at Ballyglass at six o’clock this morning (Monday 25 April ).